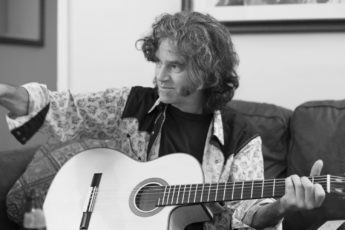 In the fourth installment of a six-week marathon of live in-studio concerts on Derk Richardson’s “The Hear and Now,” Jenna Mammina, vocals, and Rolf Sturm, guitar, return to KPFA to share the intimate magic of their duets. They’ll perform songs from their two albums, “Spark” and “Begin to Dance,” and perhaps throw in some surprises. Jenna & Rolf have shows Friday, February 2, at Nabalom Bakery in Berkeley; Saturday, February 3, at Brickhouse Coffee in Willits; and Sunday, February 4, at the Blue Wing Saloon in Upper Lake. In the second hour, Toronto-based singer-songwriter Noah Zacharin–with seven albums to his credit–will accompany himself on guitar and introduce KPFA listeners to his remarkable playing and songcraft, which have drawn comparisons to Ry Cooder and Bruce Cockburn. We’ll definitely play a track featuring the horn mastery of the late Ralph Carney and talk about Noah’s relationship with him. Noah performs Friday, February 2, at The Back Room in Berkeley. Jenna & Rolf (Jenna Mammina and Rolf Sturm) Strollin' live in the KPFA studio n.a. Jenna & Rolf Begin to Dance live in the KPFA studio n.a. Jenna & Rolf "Ubiquitous": an improvised song based on listener call-in input--the words "platform," "camembert," "cookie," "ubiquitous," "peace-ior") and the notes D, F#, Bb live in the KPFA studio n.a. Jenna & Rolf Upside Down World live in the KPFA studio n.a. Jenna & Rolf My One and Only Love live in the KPFA studio n.a. Noah Zacharin So Much Work to Be Done live in the KPFA studio n.a. Noah Zacharin In Love Again live in the KPFA studio n.a. Noah Zacharin Tom Morrow live in the KPFA studio n.a. Noah Zacharin What Have I Got to Show For It live in the KPFA studio n.a.